Growing lemon thyme plants (Thymus x citriodus) are a lovely addition to an herb garden, rock garden or border or as container plants. A popular herb grown not only for its culinary uses but for its attractive foliage, lemon thyme plants can be planted to form a ground cover or among pavers along a path or patio. The tiny flowers are a bee attractor, aiding in the pollination of surrounding plants. Growing lemon thyme plants appear as a low growing evergreen shrub with small lemon scented foliage. They are an easy plant to grow with endless gastronomic uses in any dish requiring citrus and savory notes. How to grow lemon thyme is pretty straightforward. This little Thymus variety will flourish in USDA plant hardiness zones 5 through 9, remaining an evergreen in zones 8 and 9. Plant lemon thyme plants in the spring in a full sun setting and space them 12 inches apart. These herbs enjoy well-drained soil and minimal irrigation. Attaining a height of 12 to 15 inches, this herb is extremely tolerant of poor soil and drought conditions. 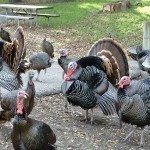 It is also resistant to deer and has no major insect or disease issues. So, lemon thyme care is as simple as planting in full sun and avoiding over watering or sitting in drenched soil, as it is prone to root rot. A hybrid thyme (T.vulgaris x T. pulegioides), lemon thyme is an erect woody based plant with a spreading habitat and thus, may need to be cut back in order to control the spread or remove unsightly woody stems. Lemon thyme plants will thrive when pruned and can even be trimmed into tiny hedges. The strong lemon aroma of lemon thyme plants is at its apex just before the flowering of its tiny purple blooms. Lemon thyme’s flavor is at its peak, just as that of all herbs, in the morning when the essential oils of the plant are most abundant. Therefore, harvesting lemon thyme is best during the early morning hours of the day to reap maximum flavor. That said, any time you trim back or prune lemon thyme is a good time to use these aromatic leaves. The oils of lemon thyme plants also make an excellent mosquito repellent when crushed; useful when outside in the evening puttering in the garden. Lemon thyme is best used fresh. Chop lemon thyme leaves just before use and add at the very end of the cooking process before they lose flavor and color. 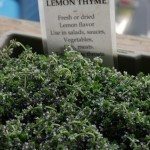 Lemon thyme may be added to poultry, seafood, vegetable, marinades, stews, soups, sauces and stuffing while fresh sprigs of this herb make a lovely garnish. A beautiful varietal, golden lemon thyme adds a nice touch in the garden with its yellow-gold variegated foliage although it has a less intense lemon scent than its green counterpart. Read more articles about Thyme.